Church Bay, Rathlin Island, Northern Ireland. 30 August 2005. Picture © Bernard Picton, Ulster Museum. 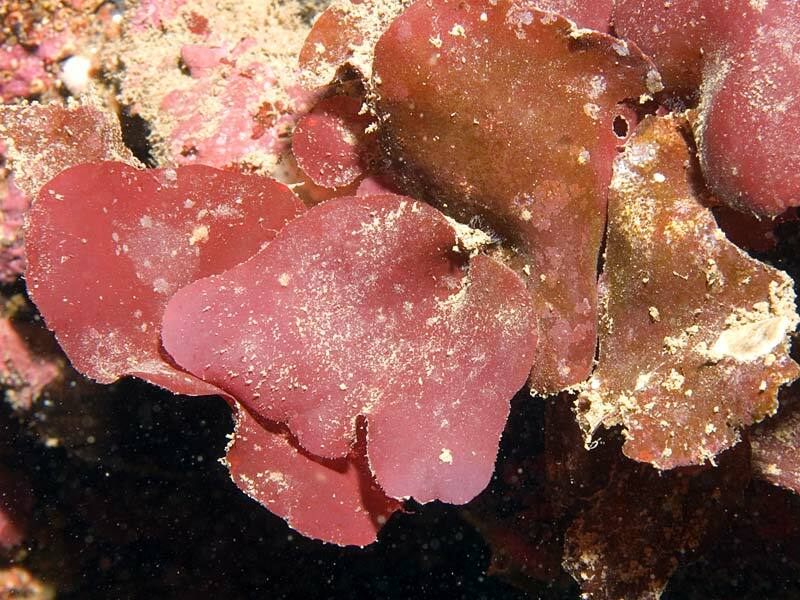 Description: Flattened, cartilaginous, rose-red, brick red to purplish fronds, simple, obovate, 10-30 mm high, stipe relatively long (about 10 mm). Often festooned with hydroids and bryozoa. Habitat: Habitat: Epilithic in the sublittoral to 15 m deep. Commonest on wave-swept shelves. Distribution: Western distribution in the British Isles on the coasts of south-west England, Wales, Ireland and Scotland. Europe: the Mediterranean, Azores, Portugal, Spain and France, Canary Islands. Similar species: Kallymenia reniformis, of which it is thicker than when mature; it is also crisp to the touch, whereas Kallymenia is soft to the touch. Site © M.D. Guiry 2000 - 2019. Important copyright notice: all text, design and photographs on this site are copyrighted by M.D. Guiry unless otherwise stated and all rights are strictly reserved. Click here for copyright information and contact. Website design: 249 Design Studio. Site maintained by M.D. Guiry (michael.guiry@nuigalway.ie). There have been 8736840 page loads since 1 January 2014 on 25 April 2019.